Anyone Can Get Out of Debt. Even Kanye West. While the details surrounding his debt are still a bit murky, the fact that a multi-millionaire can be in debt roughly twice his income is a little startling to most people. Then again, it may not be that shocking to you. If you’re like 80% of Americans, you know how it feels to be in debt. That new car probably seemed like a good idea at the time. But now you’re frustrated with the never-ending payments. We recommend a slightly different route. 1. Figure out exactly what you owe. It’s easier to hide from your debts than to stare them in the face. But you have to figure out how much you owe. Gather all your student loan statements, credit card balances, and car financing agreements and do some math. If you’re afraid to see the grand total, think of it this way: At least it won’t be $53 million! 2. Make a budget. To pay off your debts as quickly as possible, figure out how much you can put toward them each month. This is where your EveryDollar budget can help. Go through and reduce every flexible spending category possible: Cable? Gone. New Clothes? Buy used. Premium groceries? Hello, coupons. Once you’ve lowered your monthly expenses, you’ll know how much extra you can put toward debt. Remember, these cuts are only temporary, so be bold! Now, put any extra money you freed up earlier toward the smallest debt payment. When that debt is gone, focus on the next one. Then the next one. You’ll gain serious momentum and start checking debts off your list before you know it. The more you can put toward debt, the faster it will stop annoying you. 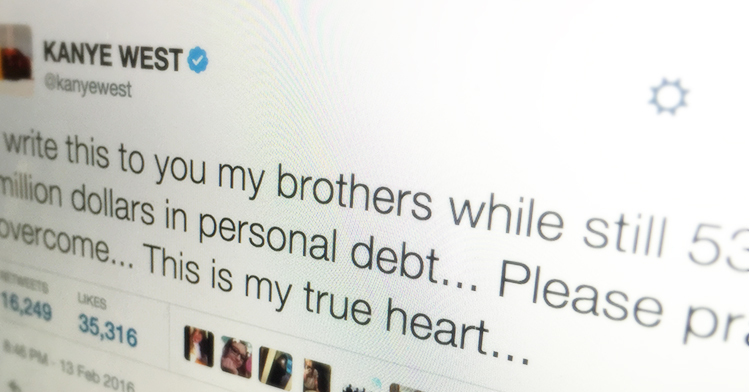 Whether you’re a music mogul or a music teacher, debt is debt. And even millionaires know it keeps them from their dreams. So, own up to what you owe, then take control of your life and do something about it! Put yourself in the driver’s seat with a budget that tells your money where to go each month. Because as nice as Mark Zuckerberg seems, he probably won’t bail you out. Only you can do that.